Potted tulips (Tulipa spp., U.S. Department of Agriculture plant hardiness zones 3 through 8) blooming colorfully indoors can relieve the gray and white monotony of winter. Bringing tulip bulbs to the flowering stage, however, requires that you provide them with a three- to four-month cooling period, unless they've been prechilled; if so, you can skip the chilling step. Bulbs that haven't been prechillled should be planted by mid-October if you want to see blooms by Valentine's Day. Single Early Group tulips, such as “Coleur Cardinal,” and Double Early Group varieties, such as “Monsella,” are among your options for forced blooming indoors. Bulbs from the Triumph or Giant Darwin Hybrid groups, such as “Apricot Beauty” or “Daydream," respectively, usually perform well also. "Coleur Cardinal" is hardy in USDA zones 3 through 8; the latter three examples, in USDA zones 3 through 7. Planting tulip bulbs in bulb pans -- shallow flowerpots about half as tall as they are wide -- with bottom drainage holes usually produces favorable results. An 8-inch-diameter bulb pan, for instance, is typically about 4 inches tall. Use a soil mixture composed of 3 parts potting soil and 1 part sand to ensure good drainage. Plant about six bulbs to a 6-inch pot with their pointed ends up and even with the top of the pot. Position the bulbs close together but not touching each other, with the flat side of each turned toward the outside of the pot and the rounded side facing the center. Fill the pot only to within 1/2 inch of the top so that the pointed tips of the bulbs protrude from the soil. After watering each pot thoroughly, cover it with a cardboard box, paper bag or newspaper, and place it in a cool place, such as an unheated garage, basement or attic, where temperatures remain in the 35- to 48-degree Fahrenheit range. The interior of a refrigerator will also work as long as it contains no produce. The ethylene released from produce can inhibit the flowering of the bulbs. If you don’t have a spot indoors that's cool enough, you can bury the pots in a trench outdoors, digging it 6 inches deeper than the height of your pots. After setting the pots in the trench, place a 6-inch-thick layer of soil over them; then cover the soil with an additional 3- to 4-inch-thick layer of dead leaves or straw to keep it from freezing.. Check indoor pots at least once a week and water them whenever their soil feels dry 1/2 inch below the surface. Outdoor pots should receive enough moisture from precipitation unless the weather is unusually dry. 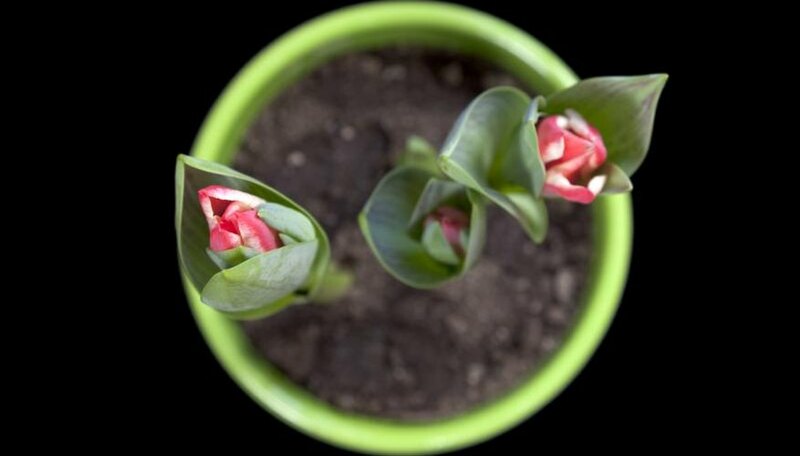 After three to four months, when the bulbs have produced shoots that are 1 to 2 inches tall, uncover or dig up the pots and place them in a warmer location in bright, indirect light -- preferably with temperatures between 50 and 60 degrees F. -- for one week. After the shoots have greened up, move the pots to a 60 to 70 degree sunny location. Tulips usually bloom within three to four weeks after they're first exposed to light. Because the plants derive all the nutrition they need from their bulbs, it's not necessary to fertilize them. Encourage the longest bloom period by keeping your tulips away from heat sources and chilling drafts, and move them to a cooler location each night. Rodale's Ultimate Encyclopedia of Organic Gardening: Fern Marshall Bradley et al.